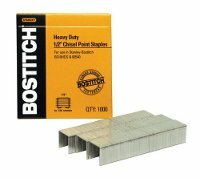 These SB35 Bostitch type staples fit the Heavy Duty 130 and Heavy Duty 215 staplers. They may also fit other stapler brands. Check the manual for your stapler for the sizes that will fit. All SB35 Bostitch type staples are sold in boxes of 1,000 staples.